The sixth of nine siblings, Mary DeMocker grew up in an old farm house outside Rochester, New York. "My life was ballet, harp, and horses," says DeMocker, who put in two years at Colby College in Maine before escaping to NYC, where she worked in film and TV production, studied at NYU, organized students for the Central American solidarity movement, and played harp on the street. "I found a spot in SoHo where they didn't mind my playing." After graduating from NYU, she came to Eugene with a UO harp scholarship in 1988. 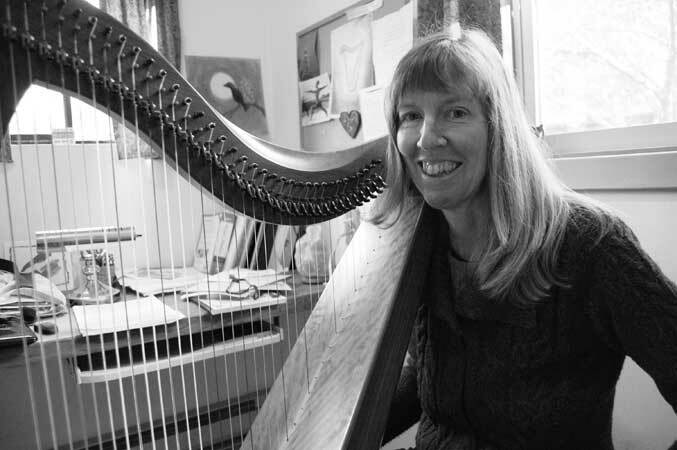 She met her husband-to-be Arthur Peck within months, toured schools with a musical program celebrating Earth Day, and began her career as a home-based harp teacher. She has also published articles on parenting since the birth of her kids Zannie and Forrest in the late 90s. A few years back, DeMocker and family began a Halloween tradition with a front-yard display of cardboard tombstones bearing inscriptions such as "Climate Change Denial" and "Oil Addiction." After last fall's display, the family has gone on to engage its South University neighbors with several more interactive "front-lawn theater" installations, each one aimed at a particular social or environmental issue. See photos of all the recent displays at marydemocker.com.